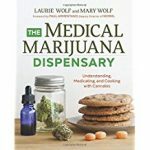 The mother and daughter-in-law team, Laurie Wolf and Mary Wolf offer an introduction to medical marijuana in their book, The Medical Marijuana Dispensary. As owners of a company in Oregon that makes and sell cannabis edibles, they share their experiences and knowledge about the effect of cannabis on the body, the ailments it can treat, strains of cannabis, and the various ways it can be taken. Many cannabis recipes for remedies and edibles are included. After outlining the benefits and risks of using cannabis, the authors discuss various delivery systems and include information on equipment needed, type of marijuana required, associated costs, the use for which the delivery system is best suited, directions for use, and pros and cons of the delivery system. For example, vaping requires a vaporizer for $70-$600, requires cannabis flowers or concentrates for $5 to$20 per gram, is best for patients that have throat or lung problems so can’t smoke, and avoids problems of tar and harshness of smoking, but can rust and oxidize causing other problems. In addition if the cannabis is heated above 365 F it can release benzene a carcinogen. One of the most helpful and informative parts of the book is the section on profiles of cannabis strains. For each strain information is given on the percent of cannabinoids such as THC and CBD, the potency of the effects, genetic history, aroma and taste, common medicinal uses, and unwanted (side)effects. Forty-five strains of indicas, sativas, and hybrids are included. The section with recipes occupies a little over half the book and is divided into three chapters: Cannabis Remedies, Savory Cannabis Edibles, and Sweet Cannabis Edibles. The cannabis remedies include butter, oil, and flour, as well as lozenges, body lotion, and suppositories. The savory cannabis recipes offer selections for omnivores, vegetarian, and vegan and include several soups, and various dishes featuring vegetables, cheese, eggs and chicken. The chapter on sweet edibles includes an assortment of foods from overnight French toast, to several puddings, apple crisp, and graham crackers with peanut butter and banana as well as three smoothies. For each recipe the usual information is provided plus the reminder to start with half (or less) a serving and wait four hours to fully assess the body’s reaction it its strength and effects. The text appears to be well researched with footnotes and list of sources cited. Practical advice is offered such as tips for a patient on a budget, ways to avoid dependency, and suggestions for a medical marijuana treatment log and numerous charts and tables help to organize the information in an easily accessible way. Testimonials from patients who have used cannabis to treat their ailments bring a very human element to the test. Appendices on medical marijuana laws by state, cultivating cannabis at home, and a glossary conclude the work. Because of the recent legalization of medical marijuana in many states, research and breeding programs are adding to the wealth of information and product diversity so I advise yearly updates especially in regard to cannabis strains and health issues. To buy The Medical Marijuana Dispensary from Amazon.com Click Here.